With no rising in sight in Ulster despite the signal coming from Dublin, one man seized the initiative and assembled the United Irish forces to assert Ireland’s right to independence. That man was Henry Joy McCracken, who died 216 years ago this month. A look at his life and times, by Aengus O Snodaigh. Henry Joy McCracken was the fifth of six child born to Captain John McCracken, a Belfast industrialist, and his wife Ann Joy, a daughter of the founder of the Belfast News Letter. Harry (as he was called by his family) was born on 31 August 1767 and raised in the Presbyterian faith. The family later moved to Rosemary Lane (now Street). Henry took an interest in the cotton and textile business in which his father was partner and at the age of 22 he was appointed manager of Joy, McCabe and McCracken. As an employer he showed himself to be fair and to be concerned about the welfare of the working poor. It was a concern which he shared with his favourite sister Mary Ann and they both established the first Sunday School in Belfast in 1788, to teach reading and writing to the children of the city’s poor. Because it was open to all denominations it drew the wrath of the sectarian bigots in the city and the arrival at the school of the Anglican vicar of Belfast, and later Belfast High Sheriff, William Bristow, along with several women with “rods in their hands as badges of authority” forced its premature closure. The family flaunted convention of the time and employed Catholics in their home. The family was renowned for social occasions and many of the future members of the United Irishmen were guests at their soirees. 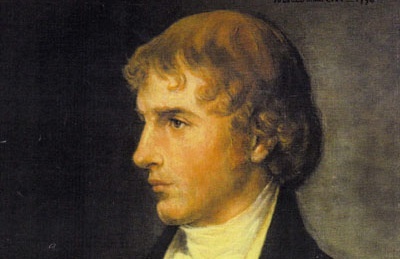 By 1791 Henry was deeply engaged in the radical politics prevalent in Belfast at the time and took an active part in discussions on Thomas Paine’s The Rights of Man published that year. He was a friend and confidant of Thomas Russell, Theobald Wolfe Tone and Samuel Neilson and was involved in the secret discussions held prior to his founding along with others of the Society of United Irishmen on 14 October 1791. He was 24 years old at the time. His sister and two of his brothers, Francis and William, shared his political views and are said to have been members of the Society. He was also an officer of the Green Company of the Belfast Regiment of Volunteers, a radical military group set up in 1792 to campaign for the goals which the Volunteers of 1780s failed to achieve. McCracken’s business, selling cotton, provided good cover for his political activities, but he soon became known to the authorities as a dangerous radical. Henry was involved in the reorganising of the United Irishmen along more militaristic lines following the Cave Hill declaration of June 1795. He was also to the fore in the moves to have the Defenders join with the United Irishmen, which was successfully achieved by the summer of 1796. Along with Charles Teeling he employed solicitors to take the cases of Catholics who had suffered at the hands of the Orangemen and they travelled widely to take depositions for these cases. Teeling made Henry Joy a commander in the Defender organisation in recognition of his work. By the time the government moved against the leadership of the proscribed United Irishmen Henry was a marked man, and a warrant for his arrest for treasonous activities was among others to be served on 16 September 1796. During the first wave of arrests McCracken was away on business and he evaded capture for a short time, being arrested only when he returned home on 10 October. He was sent to Kilmainham Jail in Dublin, where his brother William later joined him after being pointed out by the informer Edward Newell. The prisoners remained until released on bail, without trial, in December 1797. Kilmainham was a dreary and unhealthy place and Henry contracted severe rheumatism there, and remained very ill for a time after his release. While in prison he continued to try to highlight the Catholics’ plight, writing to his brother John, who remained aloof from all politics saying: “I have nothing to tell you except the barbarities commited on the innocent country people by yeomen and Orangemen. The practice among them is to hang a man up by the heels with a rope of full twist, by which means the sufferer whirls round like a bird roasting at the fire, during which he is lashed with belts, etc to make him tell where arms are concealed. The convention broke up without setting a date for the rising and asked “that the counties of Carlow, Meath, Wicklow, Derry, Down and Antrim deserve well of their country for their manly offer emancipating her directly; but that they be requested to bear their shackles of tyranny a little longer”. Fortunately, he and Neilson (now reconciled after their quarrels in jail) escaped the arrest the following month of the Leinster leaders at Oliver Bond’s house on 12 March. They remained at large continuing to make plans with Lord Edward Fitzgerald and the remaining leaders for an uprising in May, regardless of an expeditionary force. The men tasked with directing the United Irish army in Antrim and Down, Adjutant-General Robert Simms and Robert Hunter, dithered for over a week before abdicating, leaving Henry Joy McCracken to be elected by those assembled at a provincial meeting on 3 June to step in and organise the rising in counties Antrim and Down. He in effect became commander-in-chief of all the United Irish forces in Ulster. Though on paper formidable, the United Irishmen and their Defender allies in Ulster had been severely affected, in morale and military material, by the brutal terror inflicted by General Lake’s troops over the previous 12 months. Of the 26,000 supposed United Irishmen in County Antrim, only 4,000 had muskets and the United Irish army possessed virtually no artillery. One cannon had been secreted since 1793 when the Volunteers were disbanded and in charge of it in the coming battle would be a deserter from the Royal Irish Artillery who, unusually for a Presbyterian, was a sworn member of both the United Irishmen and the Defenders. Henry Joy’s first priority was to formulate a strategy, which he did along with Jemmy Hope, Henry Monroe and others. He had hours rather than days to do this as the crown forces were massing under General Nugent to thwart the United Irish rising. The plan was to launch simultaneous attacks at Randalstown and Antrim. Henry was to lead the attack on Antrim, while in County Down, Ballynahinch, Saintfield, Newtownards and Portaferry were particular targets. General Nugent in Belfast was soon appraised of these plans by a number of informers. In preparing a response he decided to concentrate his forces against the Antrim United Irishmen firstly and then hopefully to turn on the County Down division of the United Irish army. It was bold move, which if it failed would have exposed the whole of Ulster to United Irish control. McCracken issued his proclamation: “Army of Ulster, to-morrow we march on Antrim - drive the garrison of Randalstown before you, and haste to form a junction with the Commander-in-Chief”. It was signed with his name and dated, in French revolutionary style, “1st year of liberty, 6th day of June, 1798”. Early on the following morning, McCracken planted a green flag at Craigavon Fort, a Norman mound between Glengormley and Templepatrick. As rebel commander, McCracken wore a `coat of green’ as his uniform. The main assembly point for the rebels in south Antrim was the hill of Donegore. Some of the 7,000 or 8,000 who made their way there were extremely reluctant when it came to the point of risking their lives. When McCracken’s force went off to attack Antrim, most of those who had turned out remained in reserve at Donegore and later dispersed to their homes without taking part in the fighting. The Battle of Antrim took place during the afternoon of 7 June. To begin with, the forces of the crown consisted of only one troop of the 22nd Dragoon, a company of the Antrim Yeomanry and about 40 armed civilians, but General Nugent had despatched help from Belfast and Lisburn which was soon to increase that number. At 2.45 p.m. the rebels advanced, `in good order’, as James Hope later reported, `until our front arrived opposite the Presbyterian meeting house’. The arrival of fresh rebel columns from Randalstown and elsewhere might have settled the outcome if they had not mistaken fleeing dragoons just arrived from Lisburn as an attack on them and instead of completing the rout fled in panic. In the confused fighting that followed, Lord O’Neill, the governor of County Antrim, was caught near the market-house and piked. The advance of the crown forces’ main relief force from Belfast - McCracken in his inexperience had employed no roadblocks to cover the rear - eventually forced the rebels to quit the field, James Hope and his `Spartan band’ helped to cover the retreat, which became a rout by the crown forces. McCracken, along with Hope and others, retreated northwards towards Ballymena, where the United Irishmen had taken over the town and ran it through a short-lived Committee of Public Safety on the French model. McCracken found temporary safety for himself and about 100 followers on Slemish Mountain. Dislodged from there by approaching troops, some moved north, but McCracken and a dwindling band made their way across country towards County Down, where he still hoped for news of other United Irish columns with which they could join. Near Derriaghy he heard the bad news from Ballynahinch and turned back to hide in the mountains above Belfast. He was concealed in the cottage of a poor labourer David Bodle (Boal) on Cave Hill. (David’s daughter, Mary, had a child by Henry four years previously.) There his sister, Mary, made contact with him and arranged for him to have money, a change of clothing, a forged pass and passage on a foreign vessel from a secluded spot on the Belfast Lough. In a letter to her during this period he ascribed his failure to treachery “the rich always betray the poor”. He continued, stating that in Antrim “little or nothing was lost by the people until the brave men who fought had retreated.... but after the villains who were entrusted with the direction of the lower part of the county gave up, hostages and all, without any cause, private emolument excepted, murder then began and cruelties have continued ever since. “It is unfortunate that a few wicked men could destroy a county after having been purchased with blood, for it was a fact which I am sure you never knew that on Friday the 8th June all the county was in the hands of the people, Antrim, Belfast and Carrickfergus excepted”. Having spent the night of 7 July in a safe house at Greencastle on the lough shore, McCracken - disguised as a workman and carrying a bag of tools - set out to walk towards Carrickfergus with two companions, Gavin Watt and John Queeny. They had the bad luck to meet a party of yeomen, one of whom, Niblock recognised McCracken from business dealings with him. Arresting the trio, they set of for Carrickfergus. From conversation McCracken found that the yeomen were not altogether hostile and they agreed to stall a while in a public house on the roadside. Having almost managed to get the yeomen to accept a bribe of #30 to give them their freedom, disaster struck. One of the yeomen was reluctant and slipped away, returning with an officer. McCracken was lodged in Carrickfergus Castle and on 16 July was tried by court martial the following day. The Crown case faltered when one witness refused to testify, William Thompson, an English calico printer, received 200 lashes for his refusal. Samuel Orr also refused to testify against a former comrade, before two men who McCracken had never seen were brought forward by the prosecutor John Pollock. The evidence of James Beck and the other, Minniss, similar to that of most United Irish trial witnesses, was perjured. He was sentenced to death by Colonel Montgomery who presided at the trial. In the condemned cell McCracken told his sister to inform Thomas Russell “of my death, and tell him I have done my duty”. Several approaches were made to him during and after the trial suggesting that he would receive clemency in exchange for information. All such approaches were swiftly rebuffed. That evening he was hanged outside the market house in High Street, having his attempt to make a final statement drowned out by the deliberate racket created by the mounted soldiers gathered. General Nugent allowed the body to be handed over to his sister Mary on condition that it was buried before dark. The body was buried in St George’s Churchyard. Some years later, when part of the ground was sold off, some of the graves were disturbed. McCracken’s remains were reburied in the cemetery at Clifton Street, where a memorial was erected. Following his death the family moved to Castle Street, with his father and mother dying within a fortnight of each other in 1814. Though his family knew nothing of Henry Joy’s four-year-old daughter, Maria, before his death they adopted her. She was to be a constant companion of Mary Ann McCracken until her death at the age of 96 in 1866.